Multi-Grammy legend Michael Bolton performs a hit filled set list of soulful classics, power ballads, beautiful arias and songs from his Motown tribute album, Ain’t No Mountain High Enough. Michael has produced 8 Top 10 studio albums and 9 chart topping singles spanning the Pop, Jazz and Classical genres with sales of more than 53 million, and accolades include 2 Grammy Awards, 6 American Music Awards, 24 BMI & Ascap Awards, 9 Million-Air Awards, a Star on the Hollywood Walk of Fame and honours for his humanitarian work through The Michael Bolton Charities. Hits include Soul Provider, How Am I Supposed to Live Without You, How Can We Be Lovers, Steel Bars, Said I Loved You But I Lied, the Oscar nominated theme to Disney’s Hercules – Go The Distance and Jack Sparrow, ranked 3rd in this year’s Billboard Top 20 SNL parodies. 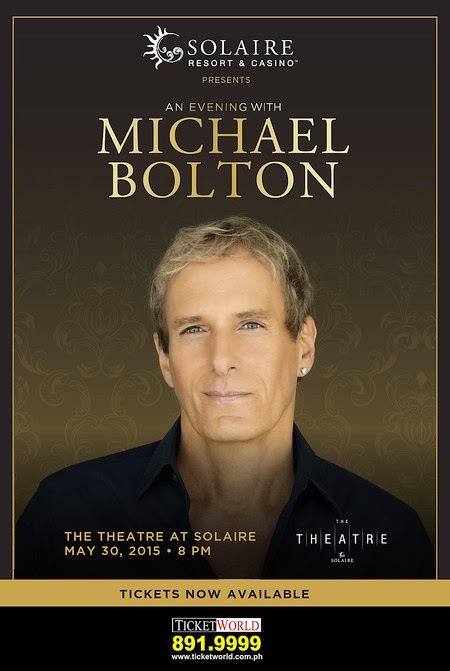 Don’t miss this sensational night with 2012’s Sexiest Man Alive (People magazine), Michael Bolton on May 30 at The Theatre at Solaire.